Prophets of Old and The Day of the End argues for a historical and literary approach to apocalyptic. 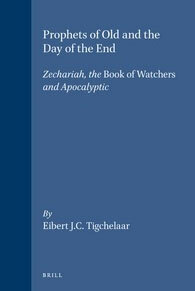 It tackles the problem of the origins of early Jewish apocalyptic by describing the correspondences and differences between some so-called protoapocalyptic and apocalyptic texts. The bulk of the book consists of exegetical studies of parts of Zechariah, Deuterozechariah and the Enochic Book of Watchers. Most of these studies offer new interpretations of the examined texts. The framework of the book presents fresh perspectives on apocalyptic. Some parts are more important to the scholar of post-exilic prophecy, and other parts to the student of the intertestamental literature. Yet, the overall approach and the conclusions bearing on the phenomenon of apocalyptic are of interest to scholars of both fields.